Sisters and brothers of America'. These five words that issued from the lip of the young Hindu monk Swami Vivekananda set the 6,000 strong audience of academics, intellectuals and spiritualists on fire at Chicago on September 11, 1893 at the first World Parliament of Religions. Rev John Henry Burrows, Pastor of the First Presbyterian Church of Chicago and a chief organiser of the parliament, recorded that the audience went into rapture with 'a peal of applause that lasted for several minutes'. After silence was restored, he delivered his historic address, comprising exactly 471 words, in two minutes. 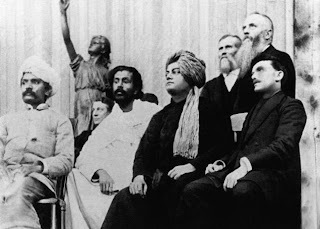 Vivekananda unveiled the Hindu view of universal validity of all faiths — an idea unknown to religions born outside India. He demolished the hidden agenda to get the parliament nod for Christianity as the superior, universal faith. Burrows was explicitly committed to the superiority of Christianity as the universal religion, to the Bible as the universal book and to Jesus Christ as the universal saviour. Admits James Ishmael Ford, of the First Unitarian Church as late as on February 22, 2009: "For many of the Christian and Unitarian organizers the barely hidden agenda was to show the superiority of Protestant Christianity. But that show was, by universal acknowledgment, totally and completely stolen by the swami from Calcutta." Unparalleled in elegance and eloquence, the young Hindu monk proudly thundered before the Parliament of Religions that Hindus 'not just tolerate' but 'accept all faiths as true'; their 'nation has sheltered persecuted peoples of all religions and all nations of the earth'; 'gathered in its bosom the purest remnant of the Israelites who took refuge' when their holy temple was shattered to pieces; 'sheltered and still fosters the remnant of grand Zoroastrian nation'. He concluded that 'sectarianism, bigotry and its horrible descendant, fanaticism', 'have filled the earth with violence, drenched it with human blood, destroyed civilisation, and sent whole nations to despair'; let the parliament be 'the death-knell of all fanaticism, of all persecutions with the sword or with the pen'. Vivekananda was just 30-years-old then. With no text or notes on hand, he spoke from within. He mesmerised the parliament. Burrows wrote: "Swami Vivekananda's three speeches undoubtedly drew most attention from the American public." A media comment was: 'Vivekananda's address before the parliament was broad as the heavens above us, embracing the best in all religions, as the ultimate universal religion'. Another comment was: '"That man a heathen!" said one, as he came out of the great hall, "and we send missionaries to his people! It would be more fitting that they send missionaries to us (America)"'. The Swami's historic speech changed the global religious discourse forever. He lived a little over eight years after he stormed America and spent half that period in India and the other half outside. In that short time, what he achieved for India, Hindu spiritualism and India's Independence is immeasurable. His nationalist exhortations deified the nation, seeded the freedom movement and inspired great leaders. Mahatma Gandhi said that reading Vivekananda had made him love the country 'hundred fold'. Jawaharlal Nehru saw the Swami as one of the great founders of the national movement, who inspired freedom fighters. Subhash Bose saw in Vivekananda "the spiritual father of modern nationalist movement". Rajaji said that but for Vivekananda we would have lost our religion, not have gained our freedom; we owed everything to him". Rabindranath Tagore said 'if you want to know India, study Vivekananda'. Mystic nationalists like Maharishi Aurobindo and Subramanya Bharathi too were inspired by him. The British police, which repeatedly found Vivekananda literature in the possession of freedom fighters and revolutionaries, even mulled action against Ramakrishna Math. Vivekananda was the spiritual trigger for national freedom. A rishi that he was, Vivekananda foresaw the rise of India a century before it began. When the world had written off the Hindu religion as worthless, Indian civilisation as dead, and Indians were slaves, the young seer said, "I do not see into the future; nor do I care to see. But one vision I see as clear as life before me is that the ancient mother has awakened once more, sitting on her throne more glorious than ever. Proclaim her to the entire world with the voice of peace and benediction." The young sanyasi's vision then would have been dismissed as brain disorder. Today as the nation is preparing for his 150th birth anniversary, like many other think-tanks have prognosticated, the National Intelligence Council of the United States said last month that, by 2030, India will overtake China and will emerge as one of the three world powers, with the US and China. Turning to America that was fast rising then, Vivekananda prophetically told the Americans that they should import spiritualism from India to handle the ill-effects of their material prosperity. The rich America did not listen to the Indian mendicant. The result is that today half the American families are broken, 41 per cent of the US babies born are for unwed mothers, and 55 per cent of American first marriages, 67 per cent of the second and 74 per cent of the third marriages end in divorce — all indices of the huge spiritual crisis in the US. When Eleanor Stark wrote in her book The Gift Unopened that Vivekananda was the unique gift for the mankind that was still not opened, she was particularly true of the US. Vivekananda repeatedly asserted that the core of India is religion and spirituality. A materially rising India needs to turn even more spiritual. The Supreme Court (in the Ayodhya case) approvingly referred to the Zakir Hussein Memorial Lecture of Shankar Dayal Sharma (President of India then) in which Sharma had said that ancient Indian thought provided for "developing Sarva Dharma Samabhav or secular thought "which enlightenment is the true nucleus of what is now known as Hinduism." However, vote-bank politics of secularism is increasingly repudiating Hindu spiritual content. This threatens to de-Hinduise and de-spiritualise India. The nation that Swami Vivekananda loved, breathed and gave his life for, is under great moral stress, with stinking corruption and shameless debauchery by public office holders. Today's youth is angry, but directionless. A desperate nation is now recalling, and looking to, Vivekananda and his great thoughts for course correction. Today is the 150th birth anniversary of the patriotic monk. This is the occasion to reconnect the Indian youth to him. Posthumously, the young monk, still living in the hearts of Indians, is the most charismatic youth icon. Did he choose to die young at 39 to remain youthful ever, to inspire and guide the youth of India eternally?